I am excited to announce version 3.1 of Cyn.in, our flagship collaboration software. This release focuses on providing multi-lingual (i18n) capabilities across the Cyn.in web interface. Cyn.in v3.1 includes an out-of-the-box support for 43 languages. Newly supported languages include German, French, Spanish, Portuguese, Hindi and Chinese among many others. See the detailed list below. 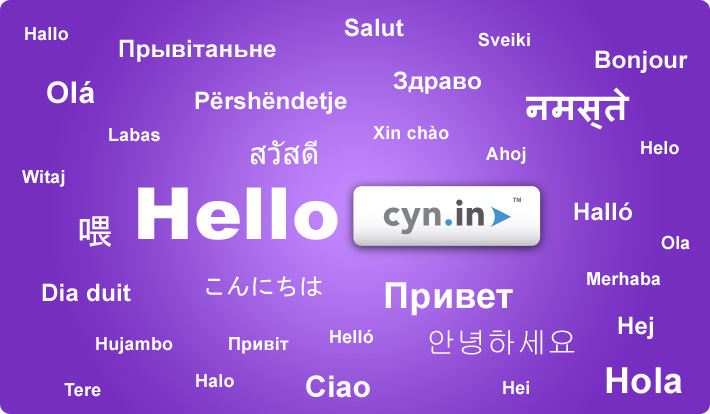 Cyn.in now lets users quickly switch to, and set their preferred language using the nifty language selector. Cyn.in will also auto set your language if you have set a default content language in your web browser. This should prove to be valuable for enterprise deployment scenarios with large and diverse userbases. The language selector displays the name of the language in English and the native language, making the identification of the desired language easy for non English users. Businesses are exploring newer geographies more than ever before, and teams are needed to collaborate across geographic, cultural and linguistic boundaries. The new i18n capabilities in Cyn.in will facilitate multinational enterprises to connect teams across the globe seamlessly. Cyn.in v3.1 now is based on the latest stable release of Plone - v3.3.2. Smooth Upgrade - Catalog rebuilding had errors due to which the internal search would have to be rebuilt after an upgrade. This has been fixed. Pure LAN based installation enabled - active Internet connection is NOT required to install from ISO CD any more. I’d like to thank our amazing community for contributing towards the translation. Some of the new languages have been translated via the Google Translate API, so validity might be a imprecise. With the help of our customers and the community, we expect to progressively improve the quality of the translations and further add new languages. We cordially invite all translators and native language speakers to assist us improve and add to the various translations of Cyn.in. Only your help can make Cyn.in the most popular collaboration software in your region and language. What do you think of the new Cyn.in v3.1? Head over to the Cynapse Community to share your feedback or to contribute towards the language translation.